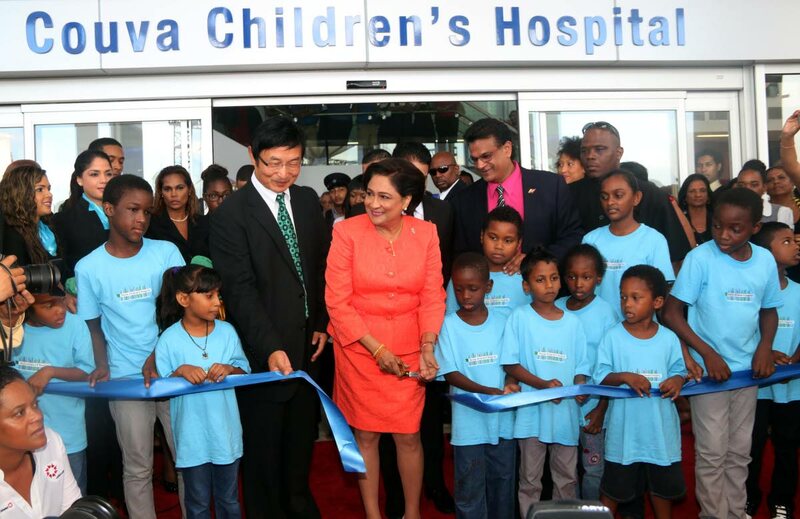 In this August 14, 2015 file photo, prime minister Kamla Persad-Bissessar cuts the ribbon to open the Couva Children’s Hospital along with the Chinese ambassador Huang Xingyuan, left, and health minister Dr Faud Khan. Now under the Dr Keith Rowley government, the hospital is to be managed under a public partnership agreement with InterHealth Canada. Government should shed more light on the public-private partnership deal for InterHealth Canada to manage the $1.3 billion Couva Children’s Hospital, Opposition members have said, especially since the firm’s operations in Turks and Caicos Islands (TCI) are the subject of corruption allegations. Former health minister Dr Fuad Khan is questioning claims of non-disclosure clauses between the Dr Keith Rowley-led administration and InterHealth Canada in operating the hospital facility, while Fyzabad MP Dr Lackram Bodoe wants to know if the facility will provide paediatric services and other services free to the public. Khan is wondering how much money would be paid to the Canadian firm. “If a management company comes to manage something, then they would have to be paid. How much are they going to be paid? What is the agreement that they made?” Khan said. InterHealth Canada is wrapped up in controversy in the Turks and Caicos Islands (TCI), a British overseas territory, over a public-private partnership agreement for the construction and operations of two hospitals. Khan said he does not know much about InterHealth Canada, a global healthcare management firm, but despite his own call for clarification he was pleased the Couva facility will be operational. “At the end of the day, I am very glad that the hospital that we built will be used. How it is going to be used, is a choice for the government of the day. Some people may like it, some people may not,” Khan said. InterHealth Canada runs UK public-private facilities and both public and private facilities in the Middle East. The following day, UWI’s St Augustine campus confirmed it met with Government regarding its role in the operationalisation of the Couva hospital. Its marketing and communications office told Sunday Newsday discussions were in the early stages and would be ongoing to work out the details of the arrangement. Therefore, there are no specifics to report. When Rowley made the announcement, UWI principal Brain Copeland said he was pleased the campus had been engaged on this venture. But Rowley’s comments did not go well with Opposition Leader Kamla Persad-Bissessar. She raised concerns about the proposed collaboration saying InterHealth Canada is embroiled in corruption allegations. According to the InterHealth Canada’s official website, the company was awarded a contract to build and operate two new hospitals for TCI’s government over a 25-year period. In 2010, it commenced clinical operations on the Cheshire Hall and Cockburn Town Medical Centres. Since 2012, when the InterHealth Canada deal was leaked via two online news sites, it remains a source of controversy due to the ongoing financial obligations. According to Euromoney Institutional Investor PLC, the launch of the hospital projects accompanied the introduction of a system of national insurance (Interhealth Canada-run National Health Insurance Plan). This means a percentage of residents’ income is used towards paying for treatment on the island. Euromoney Institutional Investor PLC is an international business-information group listed on the London Stock Exchange. Several newspapers among them the Turks and Caicos Weekly News reported that the deal is at a high cost to the people–half a billion US dollars. Based on reports on the leaked deal, if InterHealth Canada is to forfeit on the contract the government would have to prove whether the company breached the agreement. However, the exit clause by InterHealth Canada has a penalty of US$125 million, the same amount of which is the mortgage for the hospitals. President of the Couva/Point Lisas Chamber of Commerce Ramchand Rajbal Maraj said if one were to believe the media reports about alleged corruption links to InterHealth Canada, then Government needs to stay away from any arrangement with the company. The Couva hospital has been in contention since the Persad-Bissessar-led People’s Partnership (PP) administration lost the election in 2015. The facility was intended to comprise a 150-bed adult hospital and an 80-bed children’s hospital, a burns care and plastic surgery centre and specialised paediatric services. On August 14, 2015, weeks before the general election, the PP government opened the $1.3 billion facility, and officials then claimed it was completed and equipped to be up and running. But after the election, the current government said the hospital was actually not ready and several arrangements were being considered to have the facility operational. The private-public partnership between Government, InterHealth Canada and UWI is the latest for the facility. Bodoe, a former chairman of the South West Regional Health Authority, called on Government to provide information about the “extensive medical services” that were originally proposed for children. He also wanted clarification on whether local healthcare workers such as doctors, nurses, and allied healthcare professionals would be guaranteed jobs with the proposed operator. Persad-Bissessar first raised concerns about the proposed operator of the hospital at the UNC’s 29th anniversary interfaith service last Saturday. She questioned if any due diligence was done on the Canadian company. Based on Cabinet notes and minutes, she claimed Government planned to set up a special purpose company to oversee the operation of the hospital. Additionally, she claimed Government wanted to change the name of the facility. To support her claims about corruption links, she quoted from a TCI newspaper commentary titled the Turks and Caicos national health insurance scandal. The article was written by John Skippings a former director of tourism and chief marketing officer for the TCI tourist board. In that article, he said there is the mystery of how a loan for the hospitals’ contract by FirstCaribbean International Bank to InterHealth Canada for US$118,519,821 resulted in annual obligations by the Turks and Caicos people to InterHealth Canada of in excess of US$60 million per year, over a 25-year period. In response to claims of the proposed deal, details of which are not yet public, Health Minister Terrence Deyalsingh said he rejected any allegations of corruption. Instead, he said there are no issues with InterHealth Canada and forecast the initiative would significantly improve health services in this country. Reply to "What’s the deal?"